E=mc2: It may be Einstein’s most well-known contribution to modern science, but how many people understand the thought process or physics behind this famous equation?In this collection of his seven most important essays on physics, Einstein guides his reader step-by-step through the many layers of scientific theory that formed a starting point for his discoveries. 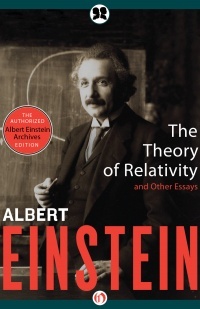 By both supporting and refuting the theories and scientific efforts of his predecessors, Einstein reveals in a clear voice the origins and meaning of such significant topics as physics and reality, the fundamentals of theoretical physics, the common language of science, the laws of science and of ethics, and an elementary derivation of the equivalence of mass and energy. This remarkable collection allows the general reader to understand not only the significance of Einstein’s masterpiece, but also the brilliant mind behind it. This authorized Philosophical Library ebook features a new introduction by Neil Berger and an illustrated biography of Albert Einstein, which includes rare photos and never-before-seen documents from the Albert Einstein Archives at the Hebrew University of Jerusalem. This title is also available in paperback from Open Road Media.